U.S. brokerage sales declined in October for the second month in a row, falling 9 percent as 2,029 boats were sold, compared with 2,225 in the same month last year. Sales volume was lower or flat in all six length categories from runabouts to superyachts, but despite the market weakness that the drop in sales signaled, the overall price paid for the boats sold in October increased from $265 million last year to $274.4 million this year, according to YachtWorld yacht brokerage members reporting in SoldBoats, their proprietary database. The majority of the price increase was delivered by sales of boats 56 feet and longer, even though fewer large yachts were sold — 68, down from 79. Among boats from 36 to 45 feet and 46 to 55 feet, the number sold was down by just two in each size range, and the total value of sales increased. Among boats from 36 to 45 feet, 542 were sold for $76.4 million, up 5 percent from $72.9 million last year. Among boats from 46 to 55 feet, 146 were sold for $41.3 million, a 4 percent increase from $39.8 million. The largest sales decline was in the smaller-boat, high-volume size ranges, where double-digit percentage decreases were reported. In the case of boats under 26 feet, October marked the second consecutive month of negative double-digit sales. Combined, the under-26-foot and 26- to 35-foot ranges had sales of 1,273 boats in October; sales were down 12 percent for the month and 4 percent for the year to date. 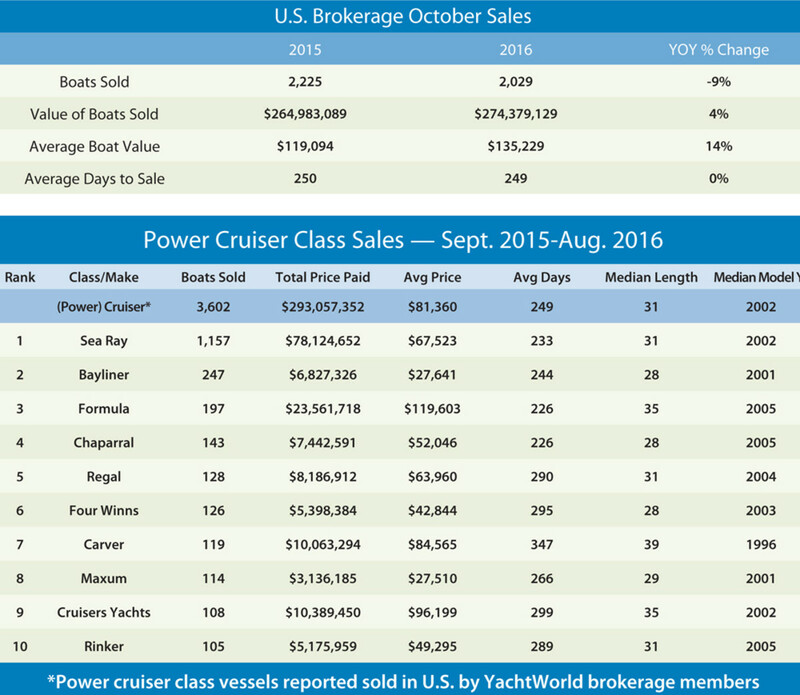 In addition to the October numbers, in this report we offer a look at the highest-volume class of boat sold by YachtWorld member brokerages in the past year — the power cruiser class — and it’s interesting to note that the majority of these boats were in the segment under 36 feet that we discussed above. We should also point out that the adjacent table shows sales figures from September 2015 through August 2016 and does not include September and October 2016 numbers. What’s most striking about this class of vessel is the number of Sea Ray models sold. Although 3,602 power cruisers were sold during the 12-month period, 32 percent of them were Sea Ray products — 1,157 boats. The median length and the model year of the boats sold — 31 feet and 2002 — were the same as for the category as a whole. The average Sea Ray price was slightly lower, as were the average days required to sell a Sea Ray. Other notable points include that in terms of age, the Carver models sold were the oldest, with a median model year of 1996, and the newest were Rinker, Chaparral and Formula boats from 2005. Average prices ranged from about $27,000 for Bayliner and Maxum models to more than $119,000 for Formula models. Chaparral and Bayliner models were of the shortest median length, and Carvers were the longest. Which brand sold fastest? Formula and Chaparral beat the class by the most, selling in 226 days, on average, and Carver was by far the slowest, at 347 days. The power cruiser class outsold center consoles during the year-long period by 499 boats and outsold other top classes — saltwater fishing boats, motoryachts, express cruisers and sail cruisers — by more than 1,200 boats.